Well fitting design! Pants fall below knee, but thighs are large enough for the plus size designation. Never received costume. USPS can’t find package. Hello! Thank you for your input on the costume order. In checking your order information, it seems the order was delivered by the USPS on 10/27/18. In looking at your order information, it seems that you did not reach out to us for help with any concerns you had about the delivery of the order. 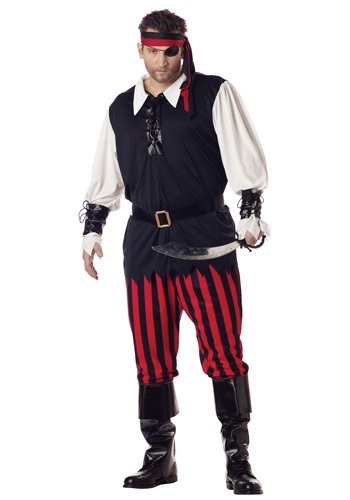 My husband is a 2X and we are never able to find a complete costume which fits on top and bottom. Boot tops fit well with black shoes; wrist cuffs were too small so just used the lacing string and perfect. Belt is a sash and looks weird for a guy to tie off in the back!